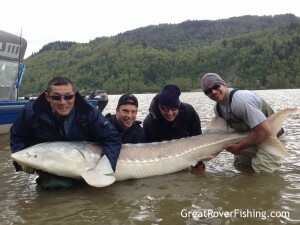 Steve and his group landed this monster! 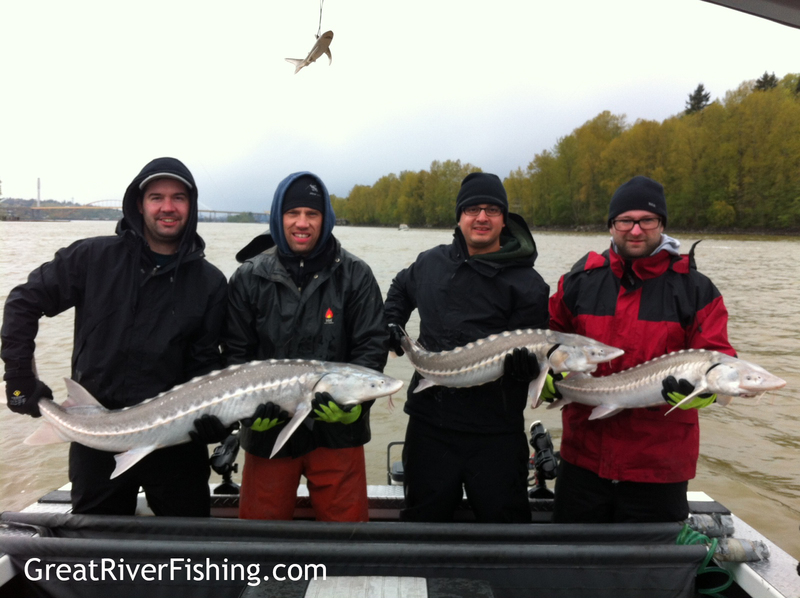 Fraser River Sturgeon fishing has been off the chain! The water has dirtied a bit and the water is slowly on the rise. The forecast for the freshet (for now) seems to be a steady one. This is great news, because it means there won’t be huge fluctuations in water levels that seem to throw the fish off. It also means an already epic beginning to our year should continue. 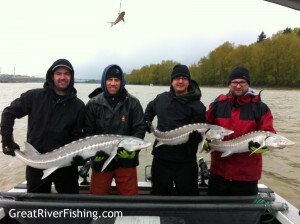 Our Great River Team is on them! I had the opportunity to get out with some wicked Alberta boys who crushed monsters for two straight days! With some giants being landed, it was a battle out there, and I’ll give it to the boys they prevailed! Eulachon and lamprey are the baits that are going to hook you up. This has been a remarkable season for Sturgeon, one for the ages and there is no sign of letting up. 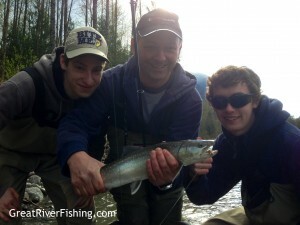 The Chilliwack and Vedder rivers have been doing well with Steelhead spread out throughout both systems. For the last couple weeks of April if you’re fishing gear roe, pink worms, Colorado blades and small spoons were the charm. 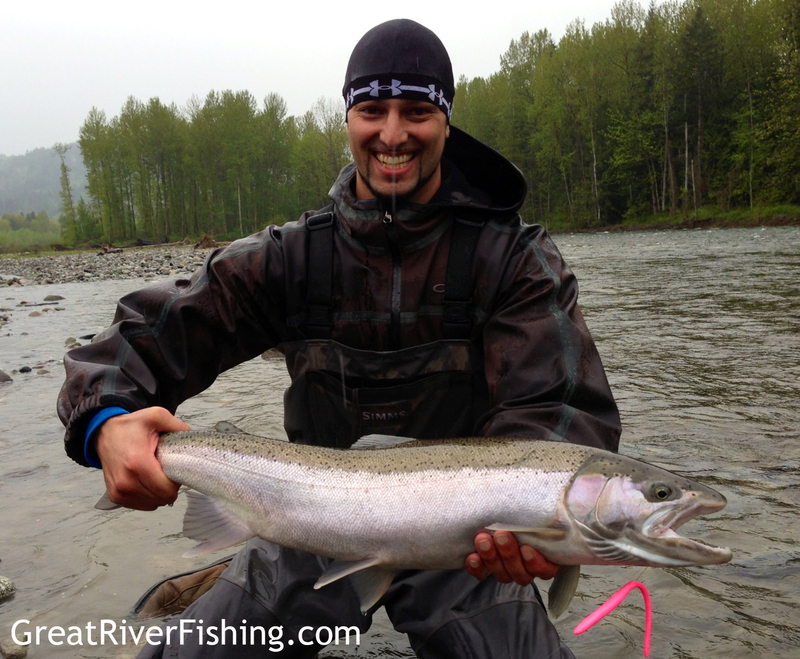 As May 1 has hit the the Vedder River is a fly only fishery, and with the “Lords of the fly’s” we have on our team, these boys will have more feathers falling than a murder of crows at daylight! And there is NOTHING like steel at the end of your fly line! The Harrison River Cutty fishing has leveled off a bit but there are still some around. When your fly fishing try to mimic any of the hatch you can see or with all the fry in the system, minnow patterns are always a good start. The same approach for gear will give you the best shot at hooking up. trout Action on the fly! The first 2013 Chilliwack River Clean up was held on Saturday, and with a record turnout, and with over 4000kg of garbage removed, it renewed my faith in mankind. I just wanted to say thanks to all of people that chipped in, and for bringing the kids out. I always think of it like this: my daughter and her generation are the ones that have to deal with what we have handed down to them. I want to be able to look her in the eye when she gets older and honestly say “Sweetheart I didn’t idly stand by and watch the destruction of this incredible resource, I took part, and did the best I could to do my part” It saddens me to think that after having this conversation with her there will be an apology about the sate that this resource is still in. If you can spare some time and help pitch please check out https://www.facebook.com/cvrcs/events There are more clean-ups scheduled and volunteers are always needed…I think we owe it to our kids. That’s it for the report. As always, pack out what you pack in, and maybe a little extra.